The last British prisoner in Guantanamo Bay has claimed that Britain knew flawed evidence, used to justify the Iraq War, had been obtained under torture – and said his lengthy detention was a result of fears that he would go on the record if released. Shaker Aamer, who is due to be freed from the US military prison after 13 years without charge, said he witnessed British agents at Bagram Air Base when a prisoner wrongly told interrogators that Iraqi forces had trained al-Qaeda in the use of weapons of mass destruction. A Foreign Office spokesman said: “The UK does not participate in, solicit, encourage or condone the use of torture or cruel, inhuman or degrading treatment or punishment for any purpose. Aamer gave statements to the Metropolitan police two years ago in which he detailed the alleged brutality he has faced, that included torture. He said he was interrogated by British agents at Bagram airbase, who knew he and others were being tortured there. Britain has a long, dark history of torture and it has gone to extraordinary lengths to hide it. 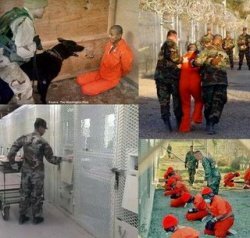 A normal functioning democracy would stand resolute that torture of any kind is not just illegal and immoral, it simply doesn’t work. David Whyte’s recent book “How Corrupt is Britain” covers some pivotal moments in the UK’s history of torture. In June 1975 an eminent Harley Street doctor flew to Dublin. The patient was suffering from severe angina, a condition which is ‘always associated with the risk of sudden death according to the doctor. The doctor was Dr Denis Leigh, a leading consultant psychiatrist at the Bethlem Royal and the Maudsley Hospitals in London, and more importantly, medical consultant to the British Army. The patient, Sean McKenna, was a former member of the IRA who had been subjected to so-called ‘in-depth interrogation’ following the introduction of internment without trial in August 1971, He was one of the 14 ‘hooded men’ whose infamous treatment forced the lrish state to launch a case alleging torture against the UK government at the European Court of Human Rights in Strasbourg. Leigh’s medical examination was being carried out on behalf of the Crown to bolster the UK defence that the men had not suffered long-term physical or psychiatric damage as a result of their interrogation. The ‘in-depth interrogation’ that McKenna and the others were subjected to consisted of five techniques that had been widely used by the British army in counter-insurgency campaigns in Aden, Cyprus, Malaya, Palestine and elsewhere – hooding, white noise, wall standing in a stress position and of course regular beatings. Dr Leigh found that McKenna’s condition was known to British army doctors before the interrogation went ahead, and ‘it would be hard to show that it was wise to proceed with the interrogation, and that the interrogation did not have the effect of worsening his angina’. In fact McKenna’s psychiatric condition was such that he had been released from Long Kesh internment camp in May 1972 directly into the care of a psychiatric unit. His daughter described ‘a very broken man, sitting crying, very shaky’. Four days after the June 1975 medical examination Sean McKenna died. He had suffered a massive heart attack. In 1976 the European Human Rights Commission (EHRC) upheld a complaint by Ireland that the treatment of the ‘hooded men’ constituted torture, and referred the case to the European Court of Human Rights for judgement. The Commission had condemned the five techniques as a ‘modern system of torture’. Britain was one of the original signatories to the European Convention on Human Rights, had been found to have sanctioned torture. Successive UK governments, rather than comply with their legal obligation to ‘search and try’ allegations of torture, adopted a policy more akin to ‘hide and lie’. This was to have consequences many years later. The inquiry into the 2003 murder of an Iraqi civilian, Baha Mousa, by British soldiers was told that the five techniques had again been used in Iraq by every single battle group in the field. ln ‘Cruel Britannia: A Secret History of Torture‘, Guardian journalist Ian Cobain provides damning evidence that the UK government did in fact ‘do’ torture, and had been doing so for decades in counter-insurgency wars from Brunei to Aden, and from Ireland to lraq. In June 2013 UK foreign secretary William Hague apologised in Parliament for the torture of Mau Mau suspects in Kenya during the 1950s. Over £50 million was paid out in compensation to some 5,000 Kenyan victims. ln 1972 prime minister Edward Heath had promised Parliament that the ‘five techniques’ torture techniques would never be used again. As declassified documents now show, prime ministers and cabinet colleagues over the decades actually went to great lengths to ensure that those responsible for torture would not face sanction or prosecution and actively covered up these crimes. In another case in Afghanistan, among the Britons who were picked up was a man called Jamal al-Harith. Born Ronald Fiddler in Manchester in 1966, Harith had converted to Islam in his 20s and travelled widely in the Muslim world before arriving in Afghanistan. After 9/11, he had been imprisoned by the Taliban, who suspected him of being a British spy. A British journalist found Harith languishing in the prison in January 2002 and alerted British diplomats in Kabul, believing they would arrange his repatriation. Instead, they arranged for him to be detained by US forces, who took him straight to an interrogation centre at Kandahar. In all, nine British nationals were sent to the maximum-security prison atGuantánamo, along with at least nine former British residents. All were incarcerated for years, and from the moment they arrived they suffered torture including regular beatings, threats and sleep deprivation. All were interrogated by MI5 officers and some also by MI6. In December 2005, the full truth about British complicity in rendition and torture was still such a deeply buried official secret that Jack Straw felt able to reassure MPs on the Commons foreign affairs committee about the allegations starting to surface in the media. “Unless we all start to believe in conspiracy theories,” he said, “there simply is no truth in the claims that the United Kingdom has been involved in rendition or that behind this there is some kind of secret state which is in league with some dark forces in the United States”. Straw was lying. Over the next few years, men were rendered not only from the war zones of Afghanistan and Iraq, but from Kenya, Pakistan, Indonesia, Somalia, Bosnia, Croatia, Albania, Gambia, Zambia, Thailand and the US itself. The US was running a global kidnapping programme on the basis of agreements reached at a Nato meeting. Quietly, Britain pledged logistics support for the rendition programme, which resulted in the CIA’s jets becoming frequent visitors to British airports en route to the agency’s secret prisons on at least 210 times. It has since been discovered that throughout the postwar period, it seemed, there had been a network of secret British prisons, hidden from the Red Cross, where men thought to pose a threat to the state could be kept for years and systematically tormented, tortured and sometimes murdered. It is now known that MI5 have a department called the “international terrorism-related agent running section”: the section routinely responsible for interviewing suspected terrorists. The MI5 officers who were interrogating al-Qaida suspects – men who were being tortured in Afghanistan, Pakistan, Guantánamo and elsewhere around the world – were agent handlers. It appeared that MI5 was seeking to recruit torture victims as double agents. Within two months of the May 2010 general election, under pressure from his Liberal Democrat coalition partners, as well as some of his own backbenchers, the new prime minister, David Cameron, announced the establishment of a judge-led inquiry into the UK’s involvement in torture and rendition. The man appointed to head the inquiry was named as Sir Peter Gibson, a retired judge. It is possible that MI5 and MI6 had a hand in his selection; for the previous four years Gibson had served as the intelligence services commissioner. Rights groups suggested that Gibson should be appearing before the inquiry as a witness rather than presiding over it. In July 2011, most major international and British human rights groups, including Amnesty International, said they would be boycotting the inquiry. The following month, lawyers representing victims of Britain’s torture operations announced that they, too, would have nothing to do with it. Six months later, the government announced that the Gibson inquiry was scrapped. Cameron’s government then brought forward a green paper that suggested a need for greater courtroom secrecy. Britain’s complicity in torture was to continue to be a dirty dark state secret. None of this squares with Britain’s reputation as a nation that prides itself on its love of fair play and respect for the rule of law. Successive British government’s continues to preach to other nations around the world of the importance of justice, transparency and democracy whilst disregarding essentials such as these back at home.